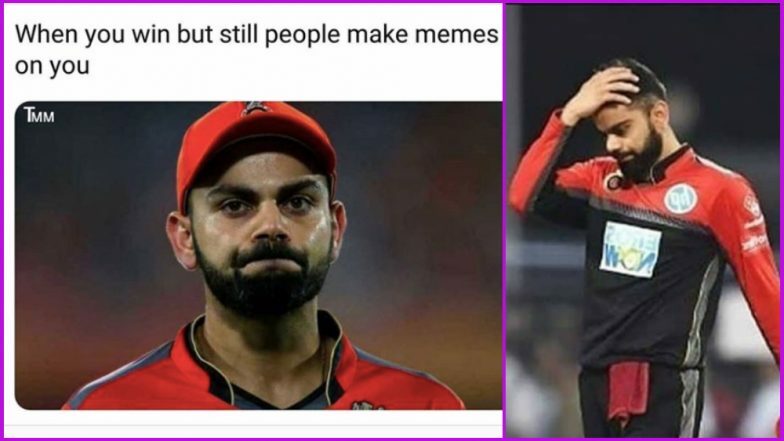 It is Royal Challengers Bangalore’s (RCB) match tonight and funny memes have started doing rounds on the internet. Mumbai Indians (MI) hosts RCB at the Wankhede Stadium in the Indian Premier League 2019 (IPL 2019) match 31. RCB after six back to back defeats registered their first win of the season against Kings XI Punjab (KXIP) and now will be looking to continue their newly found winning run. Mumbai Indians vs Royal Challengers Bangalore Live Cricket Score. It has now become a norm with fans trolling RCB before and after every game. The social media sites are filled with memes and jokes around RCB’s debacle season after season. Meanwhile, ahead of RCB’s match against MI, funny memes trolling the Virat Kohli-led side have surfaced again. Check a few of them below. No End to Funny RCB Memes Despite Virat Kohli and Co’s First Win of the IPL 2019. In their last outing, RCB defeated KXIP by eight wickets and chased down 174 in 19.2 overs. Captain Virat Kohli and AB de Villiers scored 67 and 59 respectively. Meanwhile, the fixture against Mumbai Indians will be RCB’s fifth away game of the season. Enough of Funny RCB Memes! An Open Letter to Virat Kohli Haters From Royal Challengers Bangalore Fan. No matter what it will continue..
Mumbai Indians, on the hand, come into the match having lost to Rajasthan Royals (RR) at the same venue. RCB will be looking to double the damage for Mumbai Indians and move up on the IPL 2019 points table. MI currently are placed fourth on the IPL 2019 team standings with four wins from seven matches. RCB, however, continue to languish at the bottom of the table.